The first German immigrants arrived in Louisville nearly two hundred years ago. By 1850, they represented nearly 20 percent of the population, and they influenced every aspect of daily life, from politics to fine art. In 1861, Moses Levy opened the famed Levy Brothers department store. Kunz's "The Dutchman" Restaurant was established as a wholesale liquor establishment in 1892 and then became a delicatessen and, finally, a restaurant in 1941. Carl Christian Brenner, an emigrant from Lauterecken, Bavaria, gained notoriety as the most important Kentucky landscape artist of the nineteenth century. 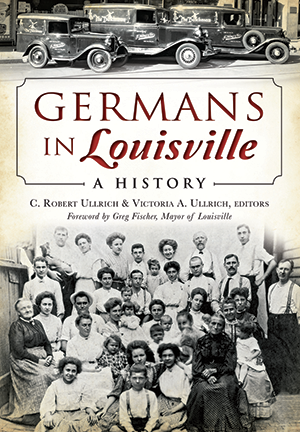 C. Robert and Victoria A. Ullrich edit a collection of historical essays about German immigrants and their fascinating past in the Derby City. C. Robert Ullrich is a Louisville native and a fourth-generation German American. He is an alumnus of the University of Louisville and the University of Illinois. He recently retired from the University of Louisville, where he was a professor of civil and environmental engineering for thirty-eight years. He is a member of the German-American Club Gesangverein, the Society for German-American Studies and the Sister Cities of Louisville Mainz Committee. Victoria A. Birchler Ullrich, a Louisville native, is a fourth-generation German American and Swiss American. She is an alumna of the University of Louisville and a former medical technologist, having been employed in clinical and research laboratories. She is a member of the German-American Club Gesangverein, and is the president of its Germanic Heritage Auxiliary. She is a member of the Swiss American Historical Society, the Swiss Ladies Society and the Society for German-American Studies.